TS GO.91 for Payment of 10th PRC Salary Arrears to TS Employees, Pensioners, Revised Pay Scales 2015 Arrears: It is good news for government employees. Chief Minister K Chandrasekhar Rao on Monday gave his nod for the payment of long-pending arrears under the PRC (Pay revision Commission) which came into force on June 2, 2014 to the employees in two installments. The Chief Minister has signed the file pending for the last two years. Officials said the pending arrears for nine months between June 2, 2014 and February 2015 would be paid in two installments. The first installment amount would be released in the present financial year and the remaining 50 per cent in 2018-19 financial year. The government brought into force the 10th PRC by providing 43 per cent fitment to all government employees in the newly-formed Telangana. ORDER: In the Government order 1st read above, orders were issued implementing the Revised Pay Scales, 2015 w.e.f. 01.07.2013, allowing monetary benefit w.e.f. 02.06.2014 and cash payment from the month of March 2015. Regarding the arrears of salary from 02.06.2014 to 28.02.2015, it was ordered that the orders would be issued separately. Tenth PRC Arrears to Govt Staff in the form of bonds: A family financial growth graph will depends on the income and expenditure of that family. If we observe some families surrounding us we can ensure that savings and planning of expenses is very important. A family of perfect planning of savings graph will grow rapidly and where the others will be stable. As Telangana state is also newly formed and T govt is trying to improve states financial condition so, some required changes are implementing. Chief Minister K Chandrashekar Rao made an announcement on February 5, 2015 in which he stated that the government staff in Telangana would be given fitment of 43 percent and it would be implemented from June 2, 2014 (the formation day of the State). Although he directed Finance Department to issue the GO the next day itself, authorities failed to do so. This was due to lack of clarity on mode of payment of arrears for nine months. 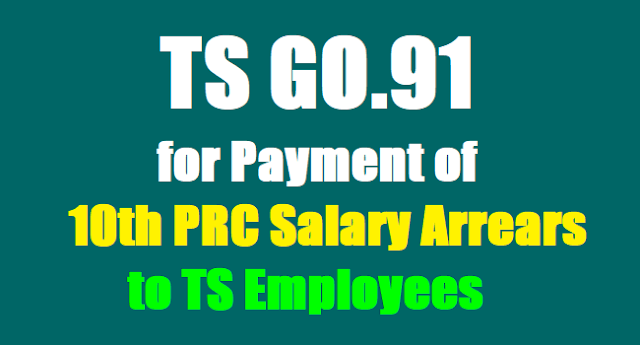 The Telangana government is understood to have decided to pay the Tenth PRC arrears to state govt. employees in the form of bonds similar to the decision taken by neighbouring Andhra Pradesh. It may be mentioned here that the government was initially in favour of adding arrears into GPF accounts of the employees. So, As a part of that TS govt is planning to give the PRC arrears to employees in the form of bonds. This amount will not be credit in GPF accounts. The beneficiary can take money in different stages (installments) from 5 years to 10 years. Employees and pensioners can draw salaries based on the new pay scales from March onwards. However, the burden on the government for paying arrears (from June 2014 to February 2015) is huge and in this backdrop decision was taken to issue bonds. Also, government is learnt to have given its nod to extend notional benefits from July 1, 2013 (the day from which the Tenth PRC should have come into effect) which would be helpful for mainly to 2.4 lakh retired pensioners. Due to these reasons there was delay in issuing the GO and then MLC election notification delayed the matter further. However, the Telangana government has written a letter on this issue to Chief Electoral Officer a few days ago, which was then forwarded to the Election Commission of India. PRC decision was taken much before the model code of conduct came into being and hence there should be no objections in this regard, the government stressed in its letter. The Election Commission has given permission to release a New PRC GOs. As govt decided that the amount of period of 9 months from June 2nd, 2014 to March, 2015 will be credited in GPF. As 43% Fitment is declared and I.R is 29% from Jan -14 which we are already claiming the rest of 14% should be credited in GPF. The increased amount of HRA, CCA etc also to be credited in GPF. To decrease the revenue burden on govt the increased amount instead of crediting in GPF will give in the form of bonds. Govt will release the PRC's GOs soon. AP is defecit budget state therefore arrears are being given in Bonds, but ours is a surplus & wealthy state so where is the justification forTS. to give Bonds and to follow AP. TS is a employees friendly Govt. Things should not be delayed so much, still PRC GOs are in waiting. Sir, these bonds are taxable?